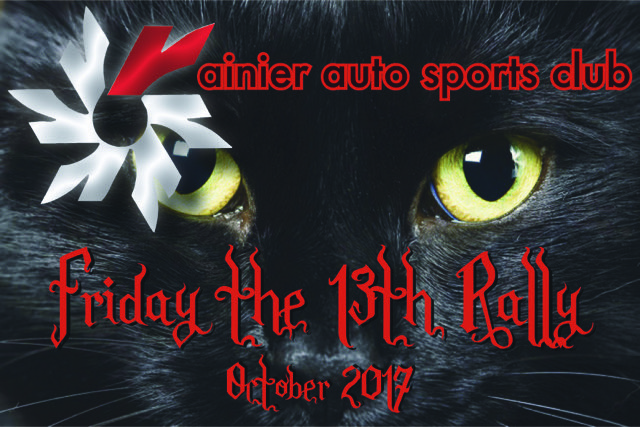 Friday the 13th Rally or Beware the Black Cat is a very straight-forward, typical RASC "no trap" drive in the woods - or at least what woods I could find. It is short at just a little over 2 hours including ODO and Finish transits. The finish has been arranged at Pizza Hut on 128th in South Everett. Friday the Thirteenth rally is done and except for a few patches of fog in the low lying areas, the visibility was good as we were rain-free. The rally came off with very few glitches and we only received three time allowance requests. I was very surprised to arrive at some kind of shindig at the Pumpkin farm on Elliott road with what seemed like hundreds of cars parked in the field and a Sheriff parked on the side of the road waiting to control traffic. I was afraid if that let out before the rally got through we would have trouble, but apparently all got through unscathed. We had nineteen cars start and all finished. Thank you all for entering and congratulations to the winners. Many, many thanks to my skeleton crew: Mark Nolte, Charles Aggenbach, Richard and Dolores Ranhofer, Marcus Hansen, Marvin Crippen, and last but not least, Eric Horst who did registration, started cars along with Marvin, and helped out at the finish.